As you have already read in a prior post, the 14U boys pulled it together at the Nationals in Sherbrooke, Quebec and returned home with the Tier 2 gold medal proudly draped around their necks. It was a very intense weekend of constant challenges, as the boys continued with their rollercoaster style of play. On the first day of competition, they started strong, easily taking their 1st game 2 sets straight with scores of 25-12 and 25-6. They dropped the next game in a tiebreaker 3rd set 19-25 after losing an uninspired 1st set 19-25, but coming up with strong individual performances to take the 2nd set 25-15. The final game of Friday’s pool play was against the Pakmen, and although DA managed some focused play and sustained rallies, The Pakmen on this occasion were overwhelming, taking the game in two straight sets, 18-25 and 16-25. Saturday’s play was a continuation of the boy’s style throughout this season. While the hope was there that they might change it up; thereby making it a little easier on themselves, the desired rhythm of play continued to elude the boys. Although they squeaked out a 25-23 win in the 1st set of their 1st game, the team struggled to bring their strong individual plays together into one cohesive playing unit. The 2nd set was another struggle for points as their service game fell flat and they lost 19-25. The 3rd set was a very disheartening 5-15 loss. But as I have stated, this is a team which loves to keep everyone, and I suspect even includes themselves, guessing about how they are going to perform after such a let down. True to form, game 2 against the Quebec Samari saw strong serving and quality defense by all concerned. Vince, Riley and Jon served up multiple aces, while Jared, Bradley and Alex were solid at the net to take the set 25-13. More motion sickness for the fans as the 2nd set was another tough, seesaw battle for points for both teams. Samari managed to get the upper hand for the last few points and won 22-25. The final set had a little of everything, saw DA jump to an early lead and, with a little help from a self-distructing Samari team, take the win 15-7. The last game Saturday, vs the Maverick Bandits, finally gave some signs the boys were really starting to take this seriously and you could see it in their eyes, the desire to win building from smoldering embers to a blazing fire. While this translated into some extraordinary nailbiting action, the lads still were having difficulties getting a solid rhythm to their overall play. This resulted in another 3 set game, with the results being a 25-18 win, followed by a very close 23-25 loss and an even closer (closer than the score would indicate) 13-15 loss. While we don’t know exactly what inspirational words coaches Mike and Adam expressed to the boys before Sunday’s semi-final match vs the Titan de Limoilou of Quebec, their words had the desired effect. After a slow start that saw DA once again in the unenviable position of having to play catchup, all the boys played their hearts out. 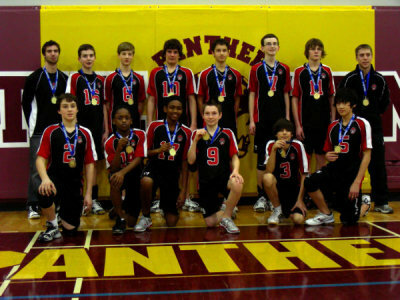 And I do mean all the boys, as the coaches strategically played everyone and even though both sets were hard, point for point battles, Durham – with strong serves and more composure during extended rallies, lined up for the gold medal game with wins of 25-20 and 25-18. Have I mentioned how Durham Attack raised their level of play over the course of the weekend? Of course this didn’t mean they had an easy go of it….ever! And the gold medal game, in which they faced down the Quebec Samari, was no different. While they got off to a strong start in the 1st set, with a combination of good serves, good sets and excellent rally completions, a mid-game momentary loss of concentration caused more nailbiting, and perhaps even a silent prayer or two as the Samari came back to tie it up. After a DA refocusing time out, Marcus came up with some timely aces to combine with strong efforts at the net by Vince and Alex to give DA the 25-22 win. The final set was won due to the boys maintaining their momentum and quickly figuring out how to handle Samari’s pretty awesome serving. The fires were burning bright as extra effort on defense and challenging rallies resulted in a solid 25-13 win for the Gold Medal. Add this final medal to their previous 1 gold, 1 silver and 1 bronze and this equals a very successful season for the 14U boy’s team. Of course the medals are just a bonus to the real awards achieved this season. The boys learned teamwork, motivational skills and sportsmanship, which will prove invaluable in the future, both on and off the court. Jared, Connor, Tyler, Vincent, Jordan, Jonathan, Riley, Alex, Tristan, Matthew, Bradley, Marcus and coaches Mike, Adam and Steve….thank you! It was one heck of a ride. A more indepth review of the boys National Championships experience will be forthcoming when time allows, but I just wanted to let it be posted that the boys ended their season on a high by coming home with the gold in their tier 2 performance. Mega congrats to the whole team and coaching staff for bringing it together when it counted most. The 14U Durham Attack Black came into the Provincials ranked 10th out of 26 teams. On Friday, day 1, their play was reminiscent of pretty well every tournament they have been in this season. In game one against the Stratford Cobras, DA came out strong, played smart and won 25-11. 2nd set their play was less intense and they lost 21-25. The tiebreaker was another display of comeback intensity and they won 15-3. The Markham Stingers Gold came up against the strong defensive play of Jared, Matt and Bradley and solid serving from Riley, Jon and Connor. DA took both sets in a decisive manner, winning 25-17 and 25-19, respectively. The last game of the pool play, against the Riverside Rage, saw DA facing their first really strong competition. In the 1st set, both teams were serving well and provided entertaining, concise defense. DA fell behind about midway but after some solid serving from Jared and Connor they came back and with a couple of well placed x-court slams from Alex, took the set 25-22. The 2nd set saw Durham return to a struggling offense, although keeping pace with some good defense. Unfortunately, about the midway point the pressure seemed to affect DA as they stumbled over misplays and bad serves, finally losing 16-25. But then, in the tiebreaker, Durham was the team applying the pressure and the visibly flustered Rage dropped the set 15-9. Some pretty exciting, nailbiting play the 1st day of competition landed Durham Attack the #1 position in their pool. Saturday’s game 1 saw Durham Attack with a slow start against Toronto West. It took them a while, but the boys finally got their rhythm and took the set 25-23. The 2nd set saw a smarter, more orchestrated game plan by DA. They stayed focused, fought hard through numerous lengthy rallys and won 25-14. Game 2 vs the Burlington Blaze saw another slow start by the boys, but that can be attributed to the changeup of players taking the floor. With Matt serving well and Tristan, Jared and Connor holding defense at the net, DA had a decisive 25-18 win. Set 2 Saw Vince, Jared and Matt serving extremely well, assisted by Tristan holding the middle court and Riley and Jordan controlling play at the net. A constant focus on form and sets, the extra effort displayed by the boys resulted in a 25-17 victory. Competition was heating up, and set 1 of game 3 vs the Kitchener-Waterloo Predators Purple saw DA playing catchup from the first serve. While their defense was tight, their offense left something to be desired. The Predators took full advantage and prevailed 25-22. In set 2, DA once again took early control with a strong defense and steady serving from Jon, Brad and Connor. Concentrating on each point, DA took the 2nd set 25-21. The tiebreaker was a heartbreaker. After taking an early lead, Durham Attack found ways of making it more difficult for themselves, lost control and although challenging to the last point, lost 16-18. Sunday’s elimination rounds – as the level of competition raised a notch or two, the rollercoaster ride continued. In the 1st match vs the Maverick Bandits, not only was Alex taken off with a shoulder injury, but the team seemed to have misplaced some of the aggressive playing style exhibited Saturday. 1st set was another back & forth battle with the Bandits stealing the win 27-29. DA found their missing aggression in set 2, serving solidly, maintaining their concentration and winning 25-16. The tiebreaker saw intense play from both sides, with Durham capitalizing on a couple of good breaks to win 15-9. Set 1 vs Forest City Green found Durham Attack out of formation, giving up easy points and losing 18-25. Alex returned to the lineup for set 2, the boys once again regained their focus, played hard and won 25-12. The tiebreaker was another example of how strong Durham Attack can be. They came out, took an early lead, and even though they experienced a slight lapse, allowing for a close game, never let up and won 15-13. These boys have more ups and downs than a trampoline gymnast. In the semi-final against the Niagara Rapids, they took an early lead but became inattentive and gave away points, allowing The Rapids to take control and the eventual win at 24-26. Getting their heads back into the game for the 2nd set, the boys came out as a team, challenging for every point, maintaining focus, being aggressive and took the set 25-12. In the tiebreaker, although they maintained the pressure, fighting all the way, the lads appeared to be tiring and just didn’t have enough to finish it off, losing 11-15. It was a long, hard struggle to the bronze medal game, and it appeared to have taken its toll on the boys. They looked tired and the Predators, stronger and perhaps hungrier, took the 1st set 11-25. Determined not to just roll over, the 2nd set saw some spirit return to Durham’s play and they gave it a good try before succumbing to the Predators onslaught 20-25. It was one heck of a weekend and Jared Harris, Tyler Paxton, Connor Forrest, Vince Thieu, Jordan Barkley, Jon Orrett, Riley Dyment, Alex Hatzinikou, Tristan Swinden, Matt Romain and Bradley Whitlock should all feel proud of their contributions to the weekend’s overall results. After all, coming in 4th out of 26 teams and moving up from 10th in the rankings is no small accomplishment. One more challenge remains; the Eastern National Championships! Everyone is looking forward to a renewed energy and perhaps even a return to the lineup of teammate Marcus Francis, out these past few weeks with a broken finger, to enable Durham Attack Black to finish the season on a positive high. 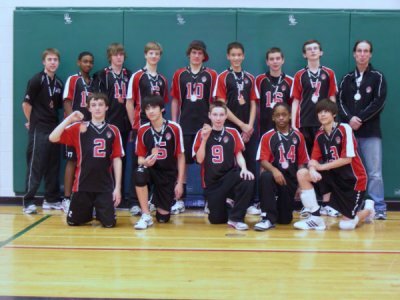 The Durham Attack 14U Boys entered this tournament with the expressed desire of gaining as much playing experience as possible before Provincials. By the end of the day there was little doubt the boys had achieved their goal, although in a fashion I don’t think even they were expecting. The boys seemed to have some trouble maintaining their focus and momentum throughout the day, playing hot and cold from start to finish. When they found themselves pacing their opponents it made for a challenging set. But once the boys got behind and had to play catch up, they started making mistakes they wouldn’t normally, and then had to struggle to regroup. This was evident from the first game against the Markham Stingers Black, who the DA paced for most of the 1st set until the last few points strung together by the Stingers. In the 2nd set the Stingers came out fast and strong, catching Durham somewhat flatfooted and visibly flustered. Stingers took the game 25-19 & 25-14. After a break and some inspirational words from coaches Mike and Adam, the second game vs the Hamilton Heat went much better for Durham. Taking the lead from the first serve, Durham Attack played with a much more positive attitude and it reflected in the score. Both teams had their share of good and bad plays, making it an interesting match to watch. The Heat managed to squeeze out the last couple of points to pull off a 25-23 win. DA started the 2nd set with another concerted attack and jumped into a lead that this time turned into a 25-16 win. The tie breaker was another example of how well the boys can do when they stay focused. A combination of strong serving and solid defense at the net gave DA the 15-8 win. In the quarter final against Burlington Blaze, the solid play continued, with the Blaze challenging throughout. The 1st set saw a determined Durham squad overcome an initial points deficit to take the win 25-18. However, the 2nd set saw more struggling and lackluster play by DA and the Blaze took full advantage, winning 25-16. The tie breaker again saw the determination return to the boys play. Despite some questionable calls after DA took an early lead, both teams created numerous exciting rallys before Durham prevailed 15-13. The semi-final against Toronto West saw a return to the struggle for a rhythm and focused play from the boys. While the 1st set was a collection of frustrating calls and misplays, with the fast and strong Toronto West team winning 25-18, the 2nd had some good moments, like Tristan’s 5 point serving streak followed closely by Alex’s 4 point addition, accompanied by strong defense at the net from Jordan and Jared. Not enough on this occasion unfortunately, as Toronto West managed a brief flurry of points to take the win 25-22. Finding themselves in the Bronze Medal game at a 15U tournament, the boys confidence was riding high as they started the 1st set against the STVC Helios Titans with a quick 8 points to 3. While there was some decent serving from DA, the strong defense at the net by Jared, Jon, Tristan and Alex carried the set in Durham’s favour for a 25-15 win. The 2nd set was another example of “follow the bouncing ball!” as a seesaw battle for points ensued. Durham Attack took a brief lead about ½ way through the set, but the Titans mounted a comeback which seemed to quell the momentum of DA and the Titans went on to take the set 25-18. The back and forth play continued into the tie breaker, with strong serves and solid hitting by both teams. The Titans moved into the lead just before the mid-set side switch and while the back and forth play continued, Durham could not gain any ground and the Titans took the Bronze Medal with a 15-10 win. Durham Attack 14U boys are a solid team who showed throughout this tournament that they have the talent and skills required of winners. With constant focus and concentrated play, they will do themselves proud at the Provincials. Going into this tournament, the 14U boys were still trying to establish a solid flow to their game; a maintaining of focus and drive, which has let them down once or twice in prior outings. Well, today’s result suggests they have found the chemistry that truly makes them a team; a team to be reckoned with as we head for the Provincials in April! In their first pool game vs. the Maverick Broncos, Jon, Alex, Connor, Riley, Bradley and Jared took the court for the 1st set. With goodserves, solid returns and yes, focused play, DA made a quick game of it. Connor served out the set with 5 aces for a 25-9 win. Set #2 saw Tristan, Marcus, Vince, Tyler, Jordan and Matt take to the court. After a bit of a struggle getting their rhythm, the lads hung in with excellent net play by Tristan and Marcus and fine serving from Tyler and Jordan. There were some short rally’s but mostly just back and forth points getting, until the final drop over play by Tyler, giving DA the 25-19 win. Game 2 was against the Markham Stingers Gold. Initially, it appeared DA was in for a little competition, with the first few points coming only after some entertaining, long rally’s. Jared and Bradley showed some nice double-teaming at the net while Connor had another strong service game. The Gold showed some life after a timeout, but DA would not be denied and took the set 25-10. Set #2 started with an entertaining 1st point rally, but then, thanks to a couple of DA blooper plays, the Gold gained the lead. Riley, freshly subbed in, served the team back into the lead, helping the boys refocus. The match became another seesaw battle, but thanks to the boy’s consistent serving and solid net play, the lead was maintained. A final lengthy rally, the winning point achieved off a slamming spike from Alex, and DA triumphed 25-17. The final pool competition was against Ottawa Fusion. Their confidence rising with each win, the DA boys were now playing with a very positive attitude, and it showed. A fast 8 points got them in stride, but the Fusion benefited from a let down in DA’s serving. There weren’t a lot of exciting rally’s in this set, but points were made and the lead maintained. At 22-17, after a string of 7 unanswered points, DA coaches called a timeout to draw attention to the mini comeback Ottawa was experiencing. The finish came off a missed serve by Ottawa, allowing Alex to fire two aces for a 25-18 win. Set #2 started with 3 quick aces from Tyler and then some excitement as hard rally’s determined the next couple of points, unfortunately in Fusion’s favour. DA’s brief loss of momentum actually resulted in some of the morning’s more exciting action, as the boys were forced into playing catch-up. Rising to the challenge, Vince and Tristan (with 3 aces) combined for 8 service points, assisted by some excellent play at the net by Tyler, Jordan and Matt. After a DA timeout, Alex subbed in, serving for 5 points to tie the set at 23-23. Ottawa wasn’t finished however, and took the last two points, winning 23-25. The Semi-final match pitted the lads against the Maverick Bandits. Set #1 saw another strong start, as DA quickly extended their initial lead with standout play from Bradley and well-directed spikes from Alex. Overall, it was a fast and effective game with the Durham boys in command throughout. Connor served for 6 straight points, ably assisted by Jared and Jon at the net, before Riley dropped the winner into Bandits centre court, for a 25-12 victory. Displaying an uncharacteristic hesitancy (at least in this tournament), the 2nd set had a familiar start with a seesaw battle for points. With very little in the way of rally’s, it took some good focused play at the net by Connor and Bradley and an impressive skin losing dive by Alex to keep the boys in the set. Tied at 8-8, the rally’s started getting more intense and with the guy’s focus and concentration tightening up, they started dictating the play. With their serves coming more consistently – Jared’s 3 aces certainly helped – and a fine display of control at the net by Alex, Jon and Marcus, the lead was secured. After Jon got service back with a beautifully timed jump spike, Marcus served for the win. The 25-13 win advanced Durham to the gold medal game. Having served up DA’s only lose of the day, it seemed appropriate that Ottawa Fusion provide the challenge for gold. Unfortunately for them, DA’s teamwork was at an all time high! The 1st set started with a quick 11 points for Durham, served up by Bradley and strongly supported by teammates Jared, Alex, Marcus, Connor and Jon. This match saw some very exciting rally’s, well placed sets, hits and more excellent serving. Fusion put up a good fight but just as it looked like they might gain the upper hand, Jon served for eight points, 4 of them aces, killing the Fusion drive. DA took the set 25-11. The final set was a total team effort, with everyone getting a chance to play. The action was quick and intense, with plenty of excitement for the fans. Serving was once again paramount in the points accumulation with 5 aces from Alex and 2 from Connor leading the way. A combination of diving saves, hard spikes, excellent defense at the net and determined scrambling from everyone made for a thrilling show. Jordan served out the set for the final three points, serving up an ace for the 25-13 win. Durham Attack took the game and the coveted Gold Medal. Coming off a very strong showing at the 15U Challenge Cup of just one week earlier, all were optimistic the DA Boys 14U team would be giving their fans a good show this day and, for the most part, they delivered. Starting off slowly, which appears to be their mode of operation (keep the fans guessing boys? ), their first set against the Markham Stingers Gold was a back and forth battle; but with DA keeping the upper hand in points just enough to enable them to steadily increase their lead and not play any catch up. DA won the set and continued this style throughout the 2nd set to take the match in straight sets, 25–14 and 25–16. 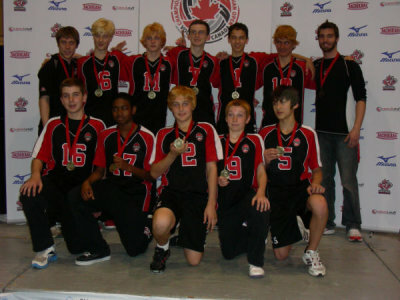 After a one match rest period, the boys came up against the Northumberland Breakers. The 1st set was something of a serving clinic, with many unanswered service points from such players as Alex Hatzinikou, Jared Harris and Vincent Thieu. Solid play at the net from Tristan Swinden helped keep many rallys alive and DA took the set 25–10. In the 2nd set, a very solid defence from all the lads and more excellent serving allowed DA to drop a few questionable points without getting down on themselves and finding themselves in the catch up mode. This time it was Jordan Barkley and Matt Romain joining Jared in serving up quality points, ably assisted at the net by Vincent, Alex and Tyler Paxton. Another straight sets victory as Durham won 25-11. The crossover game was against the Ottawa Maverick Broncos. Durham Attack continued their “clinic”; this time with Jon Orrett, Bradley Whitlock and Matt serving for the lion’s share of points, with teammates Jordan, Vincent and Riley Dyment covering the court and proving that one’s net play definitely improves at the 14U level after playing at the 15U height. Durham took the set 25–10. As the 2nd set got underway the fans had to be asking themselves “who are these guys, and what have they done with our lads?”. Jon continued to impress with his presence at the net and his first round of serves saw 4 aces (unassisted points) before the Broncos called a timeout. His focus not broken, Jon continued for 2 more (ace) serves. Riley, Vincent and Jordan showed excellent teamwork at the net, before Riley ran up 9 more points on serve, 8 of them aces. This was a terrific display of control and teamwork by all DA players. Moving into the semi-final against the Aurora Storm, a must win situation, the fellas needed some time to get their heads back into the game, having had a couple of hours downtime. It quickly became apparent after just a few minutes that DA was being challenged in a way they had not been so far this day. It was a seesaw battle for points in the 1st set with Storm having the initial edge before DA, finding themselves down 12 – 16, started a very exciting comeback. With great heads up net play by Jared, accurate sets by Connor Forrest and middle court cover by Tristan, this writer was biting his nails. Tight net play from Alex and Marcus and strong serving from Connor and Vincent enabled Tristan to finish off the set with a finely angled drop in serve. DA triumphed 25–22. Set 2 was another nailbiter! Plenty of back & forth play with exciting rallys, but the Storm just kept on coming. Storm appeared to have the required momentum, despite some excellent serving from Alex and Jared and outstanding plays at the net from Matt, Connor and Tristan. After a Storm timeout at 15-15, it returned to a seesaw battle before the Storm started gaining ground. Storm won 25-20. The tie breaker saw intense rallys, ably handled by strong defence from Jared, Tristan, Connor and Marcus, coupled with more excellent serving from Alex and Vince. They were up 13-7 before Storm found their groove and rallied back to within 2 points. DA called a timeout at 14-12 and unfortunately left their drive and determination on the bench when they returned to play. Storm took the set 16-14, and the match. This put DA into the Bronze medal game vs The Ottawa Maverick Broncos. Immediately one could tell the lads were somewhat dispirited after the Storm loss and really didn’t have their total attention on this match. Fortunately, some strong serving and defensive plays kept them in what turned out to be a struggle for points for both sides. DA held on to take the set 25-23. The 2nd set, yet another close one, with the difference being good strong play by both sides, making for exciting, long rallys. Sadly, with inconsistent play in this set, the boys found themselves on the losing end of a 26-24 score. So it was down to a tiebreaker for the Bronze medal. And DA came back with a vengeance. Vincent started it off with 5 aces in 6 serves. Focus returned, once again the setting, hits and passes were poetry in motion. When the boys remain focused and think through the plays, they usually get the point. Riley, Vince, and Jordan were strong on defense while Jon and Bradley controlled the net. Alex finished it off with 2 clean serves to give DA a 15-5 win….and the Bronze medal. Redeemed, and with a restored sense of confidence, we trust the boys will carry that feeling forward and make coaches Mike, Adam & Steve proud through the remainder of the season. With the memory of their previous tournament two weeks ago still fresh in their minds, the Durham Attack Black Boys 14U team had something to prove; to their fans/families, their coaches and most importantly, themselves. The boys started finding their groove at this 15U Tournament. First up in pool play, the STVC Helios Titans. The 1st set saw the Attack a little shaky and off balance and while they managed to come even at 14-14, they seemed to lose their focus and dropped the set 25-17. The 2nd set started with a couple of quick service points by Bradley Whitlock. This served to inspire the boys and while they did fall into another round of back and forth, point for point play, with some excellent net play and double team blocking from Tristan Swinden and Jared Harris, they managed to keep the lead despite some missed serves. At the 19-19 point in the game, you could see the realisation of a possible victory inspiring DA’s play. Unfortunately, some out-of-position calls and a couple of missed returns brought them up a little short. Titans took the set 25-21. Their spirits lifted, DA was pumped in the final pool match against Brampton’s Select 96. A combination of some fine serves from Matthew Romain and very focused rallies brought us quickly to a 6-3 lead. Our serving, a skill the boys had not been able to demonstrate in our previous 3 ball tournaments, came to life big time. With the support of solid defence, Jared added six straight points, and then Alex Hatzinikou, Jonathon Orrett and Connor Forrest combined for another six to give the team their biggest lead to date, 18-10. Focus and momentum were key to the outcome of this set and after some very exciting rallies the Attack took the set 25-17. The 2nd set saw good balanced back and forth play but after a couple of serves into the net and some double hit calls, the momentum shifted to the Selects. While our guys had some flashes of brilliance, they once again found themselves not able to put together back to back points and the Select, maintaining their focus, won 25-11. Into the 3rd and deciding set, the momentum continued to favour the Select. They took it 15-6. After a much needed lunch break, the DA boys 1st semi was against Kingston’s Pegasus. Re-energized; inspirational words of coaches Mike, Adam and Steve ringing in their ears, the boys came out strong, matching Pegasus point for point before Alex and Tristan, again assisted by strong defensive action, racked up 8 points to take a commanding lead. Unfortunately, the boys continued to make it harder for themselves by being called for out-of-rotation faults. It was tight, but an Attack win was secured: 25-23. Off track momentarily at the start of the 2nd set, DA clawed back point by point, thanks to some more excellent serves by Jonathan and confident setting by Marcus Francis and Connor. Their level of confidence rising noticeably, you could see from the stands the boys coming together as a team. With more aggressive play and some soft touch drop overs such as Connor’s game winner, DA won again, 25-20. Match 4 was against pool ‘A’ winners, Markham Stingers Gold. Again, DA’s focus and momentum was off at the beginning of the 1st set, but some challenging long rallies made for an exciting game. If not for some frustrating calls, the outcome might have been different. Stingers took the set 25-15. In the 2nd, Connor got it started by serving for 6 points, helped by Vincent Thieu, Jared and Riley Dyment at the net. Not playing catchup certainly appears to help the boys focus and maintaining their momentum, for this game saw some very long rallies, accompanied by strong serves, giving DA a 25-16 win. With a spot in the medal round looming, the deciding 3rd set was a very hard fought battle by both teams. It was very close but DA just couldn’t manage to finish off the final 2 points and the Stingers took the set 15-13. The final match of the day for Durham Attack once again pitted us against the Select 96 team. A noticeable letdown in DA’s defence let the Select run up the score before our guys could recover, resulting in a 25-13 loss. The 2nd set, with strong play by teammates Jordan Bradley and Tyler Paxton, showed DA was not ready to give up the fight. Unfortunately it was another game of catchup for DA and while they fought hard for every point, including 5 solo service points from Marcus, it was too little, too late and the final set went to the Select 96’s, 25-21. All in all, a good day of volleyball! This team is moulding into a strong unit and should be a viable contender through the rest of the season.